Papa’s day – Riggins always gives people presents. I use to think long and hard about which gift to put his name on for fear he was the giver of the more impressive present. Then I realized that the recipient was probably smart enough to figure out that Riggins didn’t really get on Amazon, place the item in his shopping cart, get it delivered, and wrap it. For dad’s day I made my father a giant (really heavy — too heavy really but it was all I could find for the right $ amount I was willing to spend) tea mug. I was lucky enough to find a silhouette online of a dog and a man who could pass for my dad and Riggins. I used the same method I did with the glasses in my past post. 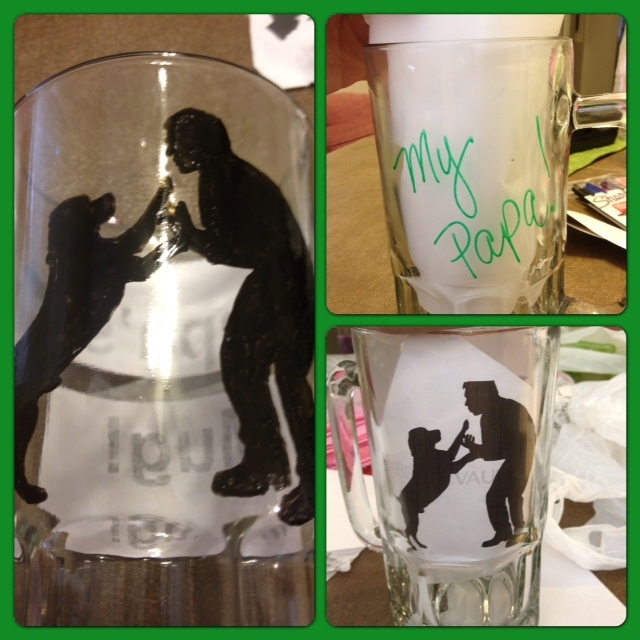 I told you more people would be receiving decorated glass gifts! Brobee head – My niece is OBSESSED with Yo Gabba Gabba. She loves them all and now tends to lean toward Foofa as her favorite, but for a long time Brobee was her main man. 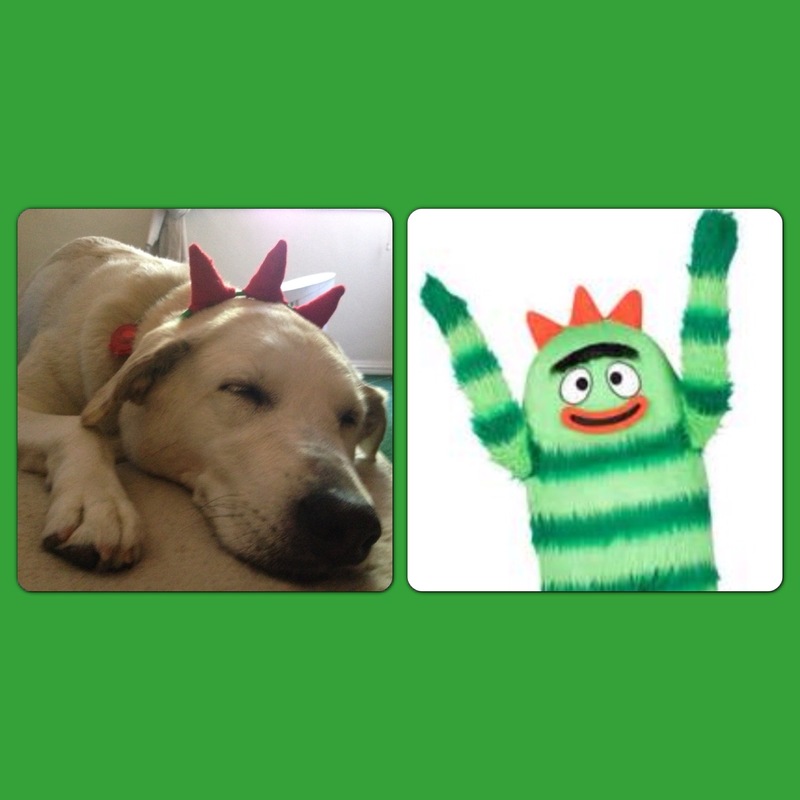 I decided she needed a Brobee headband. To be honest the headband itself is a little big but beggars can’t be choosers. I took some red felt, cut it into 3 squaty triangles, sewed each triangle together, stuffed each one with felt scraps, glued them to the headband, and then sewed the bottom of the triangles together for good measure. TADA! BROBEE HEAD! She liked it but was just as happy to have her Mom wear it. Clover was nice enough to model it for you while she was here. 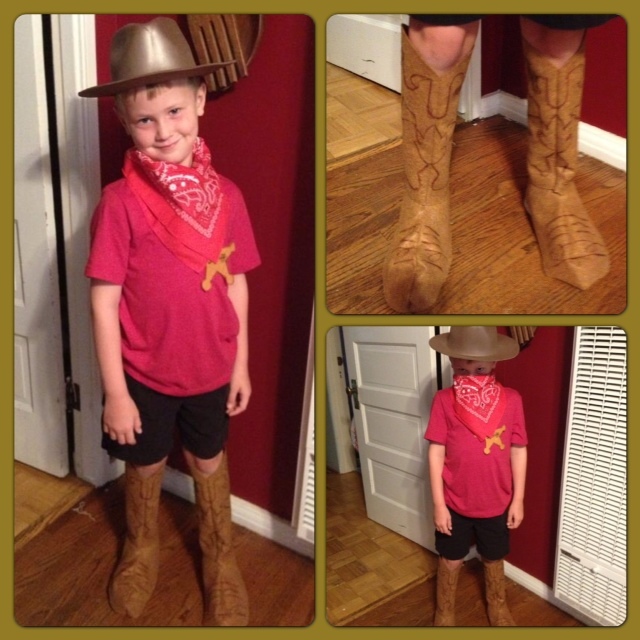 Cowboy Boots – I read on Facebook that my girlfriend’s son, Gavin, had a cowboy theme day at his school/day camp today. I LOVE dress up days. Those are always the best. I offered to make him some fake cowboy boots if she brought over the material. To make these I took one square (well rectangle) of brown felt and cut it in 1/2. I sewed the back together then used one of Gavin’s shoes to cut the top to fit. Next, I sewed the top together. For the “leg sleeves” I took two more pieces of felt and sewed them together then grabbed my cowboy boots as a template and cut the top in the cowboy shape. I put velcro on the back of the “leg sleeves” for easy on and off action. Finally I grabbed a brown sharpie and faked a cowboy boot pattern. Of course you can put a piece of elastic under the shoe part to help it stay on and even safety-pin the sleeve to the shoe cover to keep it in place. I think they turned out pretty sharp and I’m told Gavin was happy with them, which is really all that matters. 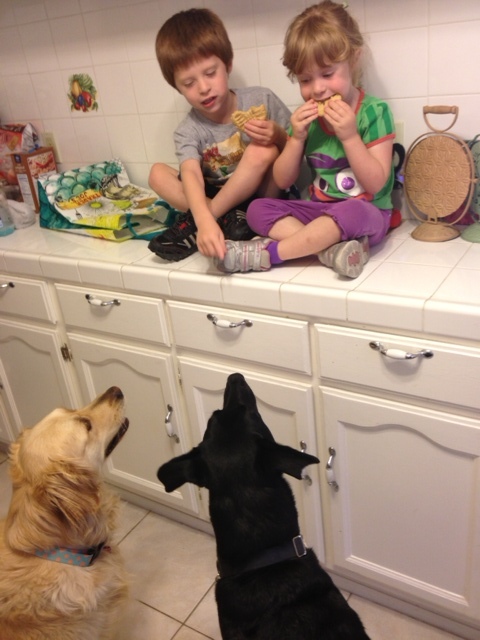 Just because I like you I’m going to leave you with this adorable picture of my niece and nephew safely eating their cookies in a location Riggins and Asscher couldn’t get to! Have a wonderful weekend!